General: Pseudotropheus saulosi is classified as a dwarf-mbuna from Lake Malawi. It was discovered by Ad Konings in 1989 while exploring along a reef that the locals called ‘Taiwan’. It was discovered by accident as Konings was scuba diving and holding onto the reef at 7 meters. He was waiting for his ears to clear so he could descend further on his exploration. It was here, as he struggled against a stiff current, that he noticed large groups of yellow fish swimming against the current. When he described it as Pseudotropheus saulosi, he named it after one of the local guides who helped him discover it – Saulos Mwale. 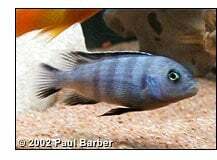 Description: The saulosi is considered a dwarf mbuna because it reaches a size of only 3-4 inches. Males are blue with black vertical bars, and females are a beautiful, deep yellow. 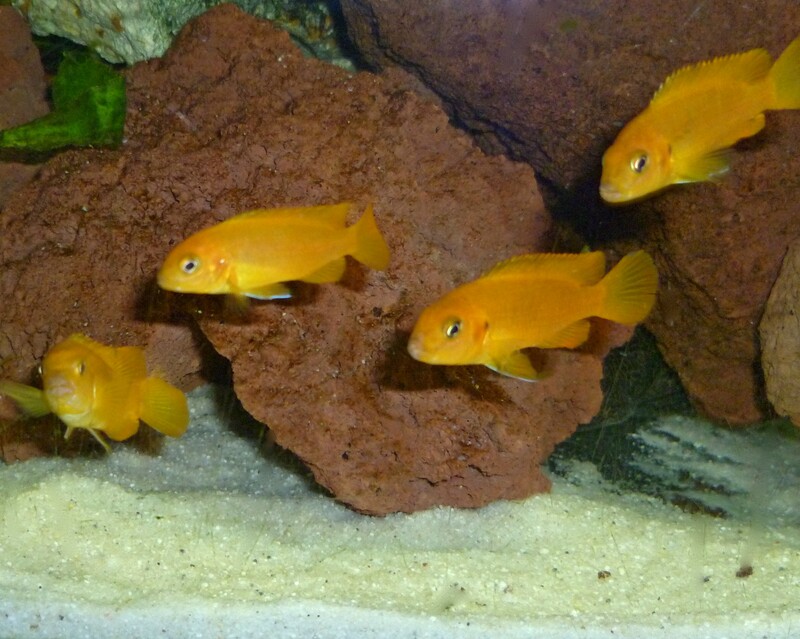 Fry are born yellow and, as they near adulthood, will begin to show adult female and male colors. In the wild: Along Taiwan reef, Ps. saulosi can be found at depths of 7-15 meters. Large schools roam the rocky areas of the reef, scavenging for food among the algae growing on the rocks. These schools contain only yellow fish. However, not all of them are females, there may also be males that have kept the female colors. Males that display the full blue coloration are those that have a territory claimed, and they seem rare when compared to the quantities of yellow schools. In the aquarium: Because Ps. 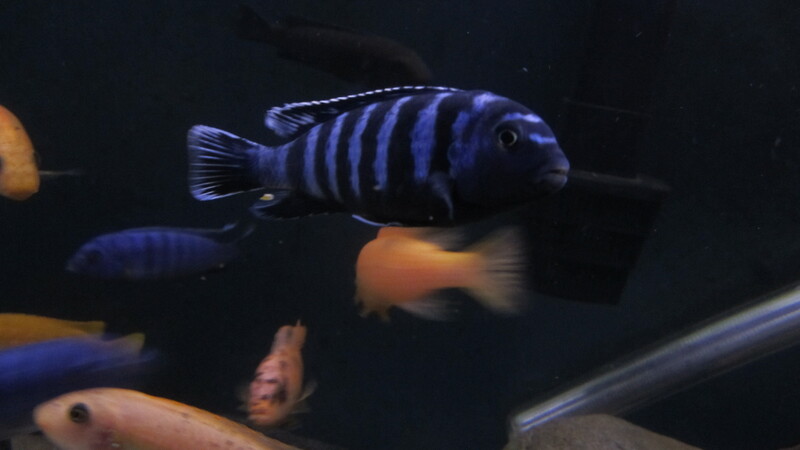 saulosi is a dwarf mbuna it can be kept in tanks that are smaller than most required for mbuna. However, they can still be very territorial, and need a lot of swimming space. 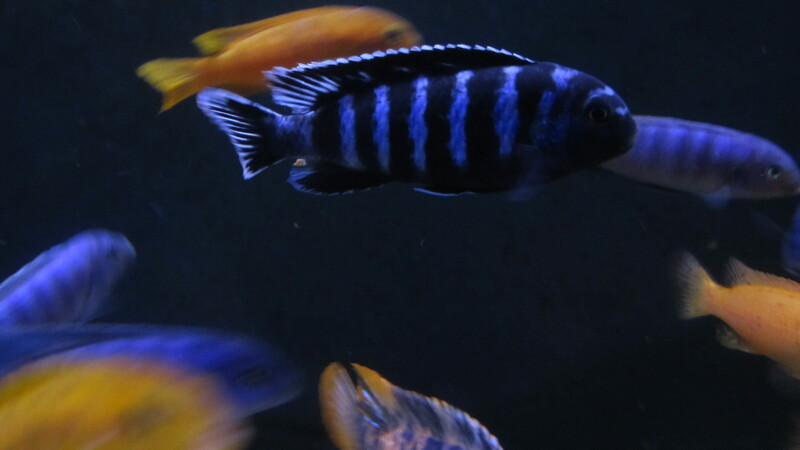 Depending on the size of the tank, you may only have one ‘dominant’ male who achieves the brilliant blue color. Other males may be a pale blue with bars visible, but the depth of color may change with the situation. 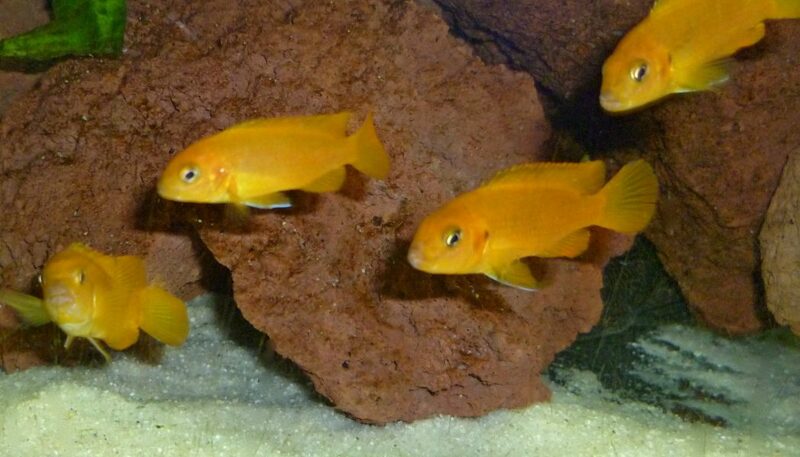 If you have younger males in a tank with a dominant male, the younger ones will keep the female colors and blend in with the females. However, the dominant male will not be fooled. He will still chase the young males much harder than any of the females. They are best kept in groups of 6 or more, allowing the dominant male to spread out his aggression against several individuals. They should be kept in tanks of 55 gallons or larger. 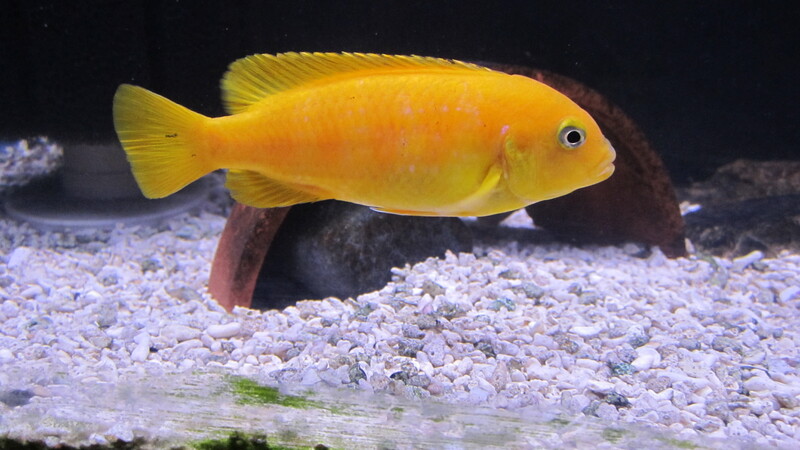 Breeding: Pseudotropheus saulosi is a maternal mouthbrooder. The male will select a breeding site, it will usually be on the sandy bottom. He may, or may not, dig a pit in the sand down to the aquarium bottom. This pit may be up against a large rock, or it may not. They don’t seem too finicky. Once his breeding site is picked out, and a female is ready to spawn, he will display by shaking in front of the female. (Note if a male is shaking in the same way in front of another male, he is displaying his dominance. The subdominant male will clamp his fins and lose his color as a sign of submission.) After displaying for the female, he will attempt to lead her back to his spawning site by swimming away, but shaking his tail in a manner only seen during spawning. Once the spawn is complete, the female will hold the eggs in her mouth until the fry are able to swim and forage for themselves. This is usually 13-18 days. The female will take food into her mouth during the brooding cycle, however, it may be to feed her fry as much as it is to feed herself. Brood sizes will usually be less than 20 fry, and 10-15 is most common. Feeding: Ps. saulosi should be fed a spirulina based diet. They will graze on algae growing on rocks and glass, but not enough for algae control. When I have to put my hand in my tank, they don’t hesitate to see if my hand or arm has anything good to eat on it. Their teeth are made for scraping algae, so it feels like coarse sand paper when they nibble. 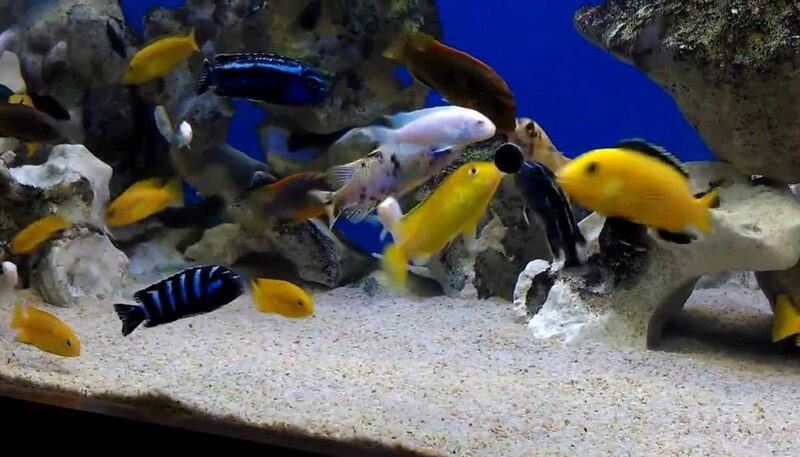 The occasional treats of brine shrimp flakes and/or cichlid flakes is acceptable, however, avoid pellets of any type. A sprig of Romaine lettuce is another good food to add for variety. Other care tips: Ps. saulosi should be kept with other mbuna approximately their size. 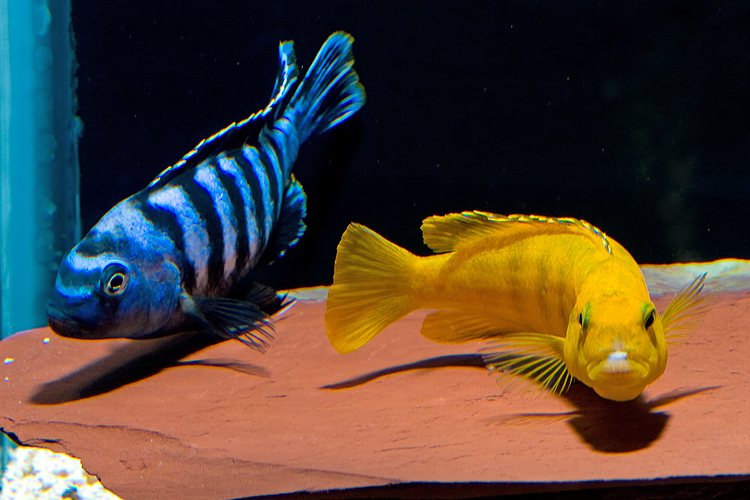 Labidochromis species make good tank mates. 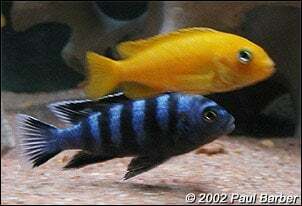 Larger, more aggressive, mbuna species should be avoided, as well as any species that has the blue or yellow colorings, if stocking saulosi in your tank.